In my youth I frequented an area known to all as Ballymore. It was the headquarters of the Queensland Rugby Union, situated at Kelvin Grove, and I went there often to play and watch football. I started going there almost as soon as the facility opened in 1966 and I have many memories of the place, from the heart-breaking penalty try that referee Kevin Crowe awarded in the dying moments of the 1968 test match that provided the All Blacks with a win over the Wallabies, to the crowd chants of "We want 50!" in the heady days when Mark Loane's Queensland Reds thrashed the NSW Blues 48-10. 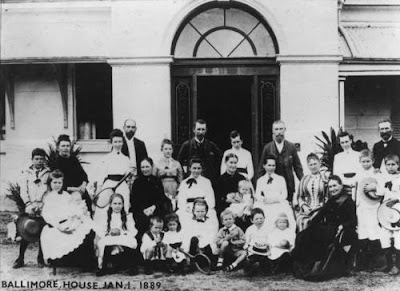 All of that is a preamble into the Campbell family headed by Brisbane businessman James Campbell, who built a house in Kelvin Grove and called it Ballymore because it was adjacent to Bally and More streets. That name was subsequently given to a street and then to the football complex known today. Here is a drawing of the house, and also a photograph of the large Campbell clan gathered outside their residence. Unfortunately the house no longer exists. James Campbell was a Scot who came to Brisbane in 1853, and finding no work in his trade as a plasterer, started his own business in George St as a merchant dealing in building materials. That early store shifted to larger premises in Creek St and from there became James Campbell & Sons, one of Brisbane's largest diversified companies that included thriving timber, cement and shipping businesses. 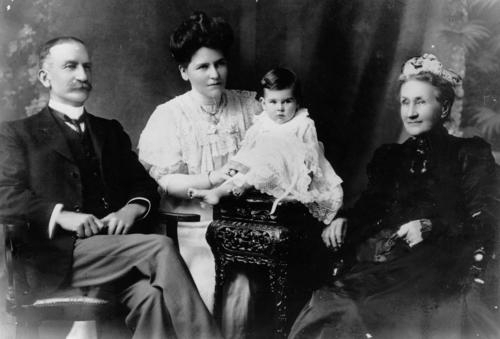 James Campbell died in 1904, leaving the business in the hands of his eldest son John Dunmore Campbell who is pictured above with his wife Minnie, daughter Molly, and his mother Isabella, the wife of James. John Campbell was chairman and managing director of the family business as it became a limited company in 1896, and he was also a politician at local and state levels as well as having many other interests. He was vice-president of the Queensland Rugby Union from 1894 to 1905. In 1889 John Dunmore Campbell had a large building erected on land he owned on the corner of Brunswick St and Annie St at New Farm. The two-storey combined retail and residential structure, known as Brunswick Buildings, still stands there today.